of Morris Carnovsky as King Lear." Roseman has devoted much of his professional life to drawing, considered the foundation of the visual arts by the renowned, sixteenth-century Florentine architect, painter, and biographer Giorgio Vasari, (1511-1574), in the Preface to his Lives of the Artists, and reaffirmed by the French master Jean-Auguste-Dominique Ingres, (1780-1867), for whom, to quote his famous maxim, "Drawing is the integrity of art." Although drawings have traditionally served as studies or drafts in preparation for compositions to be realized in another medium, drawings can be works complete unto themselves, as are Roseman's drawings which encompass a range of subjects and are complementary works to his paintings, sculptures, and engravings. A prolific draughtsman, Roseman employs a variety of drawing materials with great versatility as exemplified by the selection presented here of the artist's drawings from the extraordinary world of Shakespeare. Roseman drew Morris Carnovsky in performance in his acclaimed role as the tragic and suffering old king, seen in impressive portraits at the top of the page, fig. 2 above and fig. 3 below. One of the greatest American actors to interpret the role, Carnovsky brought a maturity of years in a long and distinguished career and a penetrating depth of character to his portrayal of King Lear. Roseman's linear descriptions in pen and ink and detailed brushwork, (fig. 3), render the downward turn of the mouth, heavy cheeks, and dark eyes. 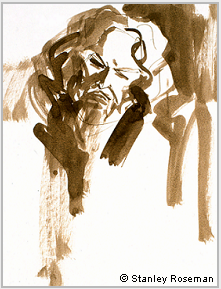 Broad, calligraphic strokes of a brush loaded with bistre ink and wash in combination with subtle textures of dry brush describe the mass of hair, beard, and shoulders and dramatically place the figure in pictorial space. 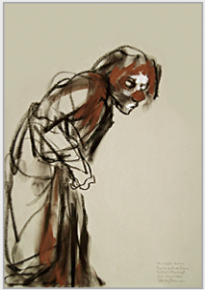 Chiaroscuro modeling of the figure intensifies the psychological impact of this masterful drawing, as Lear with dark eyes under anguished brows directly confronts the viewer. The American Shakespeare Festival, Stratford, Connecticut, presented in 1975 King Lear with Morris Carnovsky in the title role. 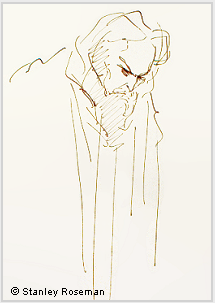 The invitation for Roseman to draw at the production of King Lear came about through an introduction to Morris Carnovsky by the artist's colleague Ronald Davis, who as stage manager and assistant director was working closely with the eminent actor at the American Shakespeare Festival. Davis earned a Bachelor of Arts degree from Bowdoin College, where he majored in English Literature and Drama, with a concentration in Literary Criticism; Medieval Prose, Poetry, and Drama; and Shakespeare. "I was privileged to experience Shakespeare through Morris Carnovsky's deeply moving portrayal of King Lear," recalls Davis. "I am very appreciative to Morris for inviting Stanley to the American Shakespeare Festival and that Stanley had the wonderful opportunity to draw Morris Carnovsky in his great role as King Lear." The superb drawing Kassya, (fig. 11), is conserved in the Musée des Beaux-Arts, Bordeaux, renowned for its comprehensive collection from Old Masters to modern art. A fascinating personage, the white-face clown Kassya, a member of the Litsidei Company from St. Petersburg, wears a white ruff and conical hat and an elegant black and silver costume. 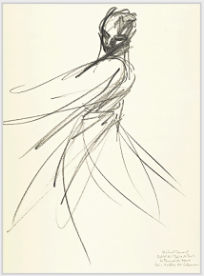 With fluent strokes of black chalk, Roseman depicts Kassya in graceful movement as he turns his head and shoulders. 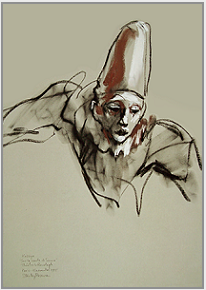 The artist's chiaroscuro modeling of the expressive face and tall hat adds drama to the image of the pensive clown who seems to emerge from the spacial dimension of the paper. The drawing of Kassya wonderfully complements the Bordeaux Museum's earlier acquisition of Roseman's portrait painting of Glen 'Frosty' Little, Director of Clowns of the Ringling Bros. and Barnum & Bailey Circus. (See Page 4 - "Spirit of the Clown.") The museum also conserves Roseman's drawings on the monastic life as well as the artist's drawings from the theatre in New York City. Francis Ribemont, Chief Curator of Patrimony, Museum of Fine Arts, Bordeaux, writes in a cordial letter to Roseman to acknowledge acquisition of a suite of his drawings, which includes Elisabeth Maurin, (fig. 9, above). The Assistant General Manager of the Metropolitan Opera, Francis Robinson, whose notable thirty-year career at the opera house included hosting the "Live from the Met'' telecasts, invited Roseman to draw at the opera. From the Metropolitan Opera's production of Verdi's Macbeth in 1973 is Roseman's impressive drawing of baritone Sherrill Milnes in the title role, (fig. 4). Macbeth, which had its world premiere in Florence in 1847, was the first of three Verdi operas based on Shakespeare's plays. Verdi greatly admired Shakespeare to whom the composer turned for his last two operas: Otello, composed in 1887, and Falstaff, in 1893. Sherrill Milnes was highly regarded for his roles in the Verdi repertory, and the renowned baritone's portrayal of Macbeth was a fascinating subject for Roseman. With an economy of line applied with vigorous strokes of the pen, the artist captures on paper the violent action and feverish intensity of Macbeth as he brandishes a sword in his upheld hand. Roseman was invited to draw at the Lyric Opera of Chicago in 1974 on the occasion of the company's twentieth anniversary season. Verdi's last opera, Falstaff, adapted from Shakespeare's comedy The Merry Wives of Windsor, and with passages taken from Henry IV, Parts 1 and 2, provided Roseman with a marvelous subject for his work in the personage of Falstaff as portrayed by Sir Geraint Evans. Sir Geraint directed the production and sang the role of Shakespeare's amorous "fat knight,'' one of the celebrated Welsh baritone's greatest roles. The National Museum of Wales, Cardiff, acquired two fine representations of Sir Geraint Evans as Falstaff from Roseman's series of work. A head and shoulders, frontal portrait drawn with pen, brush, and bistre ink depicts the square-jawed baritone with thick eyebrows and a rakish moustache and wearing a wide-brimmed hat adorned with flowers and plumes and a full ruff that adds an Elizabethan elegance to Falstaff's costume. The complementary work in the medium of drypoint engraving is presented below, (fig. 5). 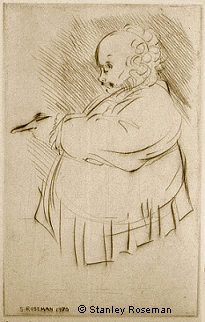 This lyrical drypoint, based on one the artist's drawings of Sir Geraint, captures the humor of Falstaff's character seen in profile, his large stomach protruding and an arm outstretched in front of him as he points with an index finger. and I am delighted to have them in our collection." The leitmotif of circular lines and forms in the composition accentuates the bulbous figure of Falstaff. Delicate incising renders the fringe of curls on the knight's bald head and the wispiness of his upturned moustache, enriched by the drypoint burr. Fluent lines define a voluminous sleeve and lacy cuff of the tunic. Staccato, parallel hatching in the background suggests the musical passages of Act One, Part 2, with the chattering, singing voices of the merry wives of Windsor. The Museum's Keeper of the Department of Art, Rollo Charles, acknowledging receipt of the donation, expresses his appreciation in an enthusiastic letter to Davis: "I write at once to send you our warmest thanks. Roseman returned to the world of Shakespeare at the Paris Opéra. With a prestigious invitation in 1989 from the administration of the Paris Opéra, Roseman resumed his work on the performing arts in the great French tradition in art that has as its subject matter theatre, opera, music hall, circus, and the dance. The pencil is for Roseman an indispensable drawing instrument and is his preferred medium for drawing the dance. Concluding his discourse on the use of the pencil in his text to the fine art book Stanley Roseman and the Dance - Drawings from the Paris Opéra, the artist states: "Pencil is a drawing instrument by which I could explore an extensive range to the quality of the line, not only to express the human form in changing patterns of dance movements but also to carry and transmit in a graphic medium the kinetic energy of the dancer." Shakespeare's Othello is the subject for José Limón's best known choreography entitled The Moor's Pavane. The work was presented by the Paris Opéra Ballet in 1991. A stately court dance of the sixteenth and seventeenth century, the pavane provides the choreographic structure for this compelling work considered a classic of modern dance. Two couples - Othello and his faithful wife Desdemona, and the treacherous Iago and his wife Emilia - play out the events of Shakespeare's epic tragedy as they dance to excerpts from Henry Purcell's Abdelazer (1695), one of the composer's most enduring suites for the theatre. Paris Opéra star dancer Michaël Denard is seen as Othello in the impressive work reproduced below, (fig. 6). Roseman draws the voluminous robes with sweeping strokes of the graphite pencil in dramatic contrast to the modelling of the face with strong highlights and dark shadows. The artist's instinctive decision in the creative process to emphasize the mental turmoil of Othello brings the viewer's attention to the intense expression on the face of a man obsessed by the thought that his wife has been unfaithful to him. Opposing emotions of love and hate are implied by the sweeping movement of Othello's sleeve, as if he were sweeping away nightmarish thoughts; the countermovement of the Moor's garments; and the striking contrapposto of the figure advancing forward and simultaneously turning to look behind him. The Musée Ingres, Montauban, conserves the drawing of Denard as Othello and the present work portraying Denard and Paris Opéra star dancer Charles Jude as Iago, (fig. 7), in their memorable performance of The Moor's Pavane. The Musée Ingres houses an important bequest by the French master to his hometown, which includes an extensive corpus of Ingres' drawings, with numerous sheets in his preferred drawing medium of pencil. Roseman's dynamic composition places both figures diagonally across the page, with Iago clinging to the back of Othello as he struggles forward, their faces obscured by Iago's outstretched arm. This remarkable drawing of Iago and Othello speaks of their complicated and turbulent relationship. The balletic version of Romeo and Juliet, choreographed by Rudolf Nureyev to Serge Prokofiev's symphonic score, presented by the Paris Opéra Ballet provided Roseman with the extraordinary opportunity to draw three great ballerinas identified with the role of Shakespeare's tragic heroine. Paris Opéra star dancer Monique Loudières danced the role of Juliet at the premiere performance of Nureyev's ballet at the Paris Opéra in 1984. The celebrated ballerina brought a passionate interpretation to the role, which she reprised over the years to great acclaim. Reproduced here, (fig. 8), is Roseman's impressive drawing Monique Loudières, 1995, in the British Museum. With a brilliant use of line, the artist has captured on paper the star dancer at a climactic moment in the ballet when Juliet rushes into the crowd of feuding Capulets and Montagues to discover the body of her cousin Tybalt, who has been killed in a duel with Juliet's beloved Romeo. Roseman's continuous pencil line - like a flash of lightning - is charged with emotion expressing at once the outward kinetic movements of the dancer and the inner turmoil of Juliet as she thrashes with conflicting feelings of family loyalty to her cousin and devotion to her lover. Paris Opéra star dancer Elisabeth Maurin was a sujet in the corps de ballet when Nureyev, as Director of the Dance of the Paris Opéra, selected her in 1985 to dance for the first time the demanding role of Juliet. Nureyev promoted Elisabeth Maurin in 1988 to the culminate rank of étoile. Esteemed as a great dramatic ballerina, Elisabeth Maurin's portrayal of Shakespeare's tragic heroine became one of the star dancer's most acclaimed roles. The Musée des Beaux-Arts, Bordeaux, acquired the superb drawing, (fig. 9), imbued with pathos in portraying Elisabeth Maurin as Juliet. Alone on stage, the dancer was confronting the darkening events in Juliet's life when the artist, standing in the wings, drew this compelling work. 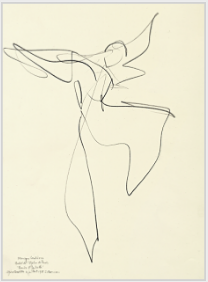 Roseman's nuanced, spiraling pencil lines - from threads of light gray to dark, ribbon-like strokes - describe a desperate Juliet falling to her knees, her head bent low and covered by the voluminous material of her sleeve as she raises an arm into the air. Roseman renders the dance movements with a leitmotif of spiraling lines and in so doing truly conveys the mental state of Juliet and her whirl of emotions. Nureyev choreographed his first production of Romeo and Juliet for the London Festival Ballet in 1977, with the English prima ballerina Patricia Ruanne dancing Juliet to his Romeo. When Nureyev was appointed Director of the Dance at the Paris Opéra in 1983, he invited his distinguished partner to be his assistant in overseeing rehearsals and performances. Ruanne was later promoted to Ballet Master of the Paris Opéra. After Nureyev retired from the company's directorship in 1989, Ruanne had responsibility for remounting Nureyev's ballets. Thus, a wonderful series of events enabled Roseman to draw Nureyev's first Juliet in his own choreography as Ruanne danced passages of the ballet in her demonstrations at rehearsals and relived her great role as Shakespeare's tragic heroine. The beautiful and poignant drawing of Patricia Ruanne as Juliet, (fig. 10), is conserved in the Palais des Beaux-Arts, Lille. The museum contains a renowned collection of Master Drawings, notably from the Italian Renaissance, including an outstanding group of drawings by Raphael, as well as drawings from the major French, Flemish, German, and Dutch schools. Roseman transposes with pure economy of line the dance movement onto the paper. 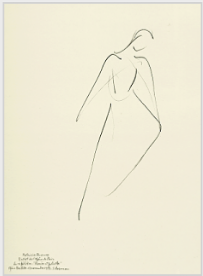 Lines of the silvery graphite pencil bring the viewer's eye to the accented strokes of the rising shoulders, the graceful ''S'' curve of the dancer's neck, and her lovely shaped head inclined to the side. A great tenderness of feeling is expressed in this beautifully ethereal work. "The drawings that you so thoughtfully brought to us are superb. 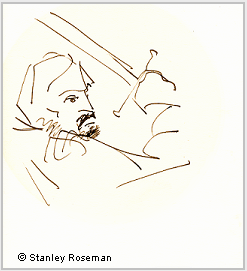 Please convey my congratulations to Monsieur Stanley Roseman for the great quality of his drawings. We are proud to incorporate the work in our collection." "These two superb works will join the three works in pencil that you have also recently donated to us and we infinitely thank you for them." The WORLD of SHAKESPEARE is a recurring source of inspiration for Roseman's work. At the outset of his career in New York City in the early 1970's, Roseman was invited by leading theatre, opera, and dance companies to draw at dress rehearsals and performances. Christophe, an auguste clown with a big, red nose and mop of brown hair, provided a comic foil to the white-face clowns in Sur la Route de Sienne. In the present work, with its harmonious interplay of line and tone, Roseman expresses emotion, gesture, and the physiognomy of his model. In this effective mise-en-page, the artist conveys a feeling of movement in the figure of Christophe trudging along, the burden of the world on his young shoulders. The Musée Ingres acquired two drawings by Roseman on the subject of the clown - "deux oeuvres superbes" ("two superb works") writes Georges Vigne, respected Ingres scholar and curator of the Musée Ingres. Presented below, (fig. 12), is Christophe, 1995, chalks on paper, from Sur la Route de Sienne. A related work of the French clown, whom Roseman drew at a following performance of the show, is in the British Museum. The Musée Ingres had made previous acquisitions in the 1980's of an oil on canvas portrait of a Trappist monk in meditation and a chalk drawing of a Carthusian monk at Vigils from Roseman's oeuvre on the monastic life, as well as a still life of small, wild apples entitled Les Pommes sauvages. 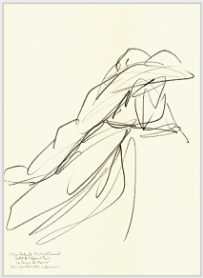 Following an acquisition of three of the artist's drawings in the medium of pencil from his drawings on the dance at the Paris Opéra, which includes Michaël Denard and Charles Jude, (fig. 7, above), the museum acquired the two works mentioned here. With a cordial invitation in 1995 from the administration of the landmark Ranelagh Theatre in Paris, Roseman took up his paper and chalks to draw a troupe of talented French and Russian clowns in Sur la Route de Sienne, a fanciful, pantomimic adaptation of Shakespeare's Romeo and Juliet with the music of Prokofiev and Nino Rota. The co-author of the show, Valery Keft, a tall, white-face clown, led the troupe of players "on the road from Siena'' - where an early version of the famous story of the star-crossed lovers was written in the fifteenth century. The Ranelagh Theatre gave Roseman the opportunity to return to the subject of the Clown after his previous work at the famous American Ringling Bros. and Barnum & Bailey Circus during the 1970's and early 80's. With stirring arias, rousing choruses, and strong character development in musical terms that bring to the operatic stage Shakespeare's tragedy, Macbeth holds an important place in Verdi's early career. The Metropolitan Opera's production of Macbeth was the first at the new opera house that had opened seven years before at Lincoln Center, the world-renowned cultural center in New York City. 1. Giorgio Vasari, Vasari on Technique, (New York: Dover Publications, Inc., 1960), p. 205. (Walton-on-Thames, Surrey: Thomas Nelson and Sons Ltd, 1997), p. 1. 3. 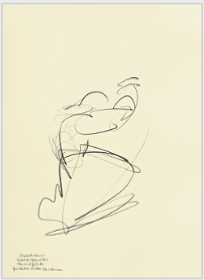 Stanley Roseman, Stanley Roseman and the Dance - Drawings from the Paris Opéra, (Paris: Ronald Davis, 1996), p. 14. "Monsieur Davis recently brought to the Musée Ingres two of your drawings representing clowns that you have generously offered to the Museum.